If you’re pushed for time, a long weekend can be the perfect way to build travel into a hectic lifestyle. And as long weekends go, York is the ideal destination. 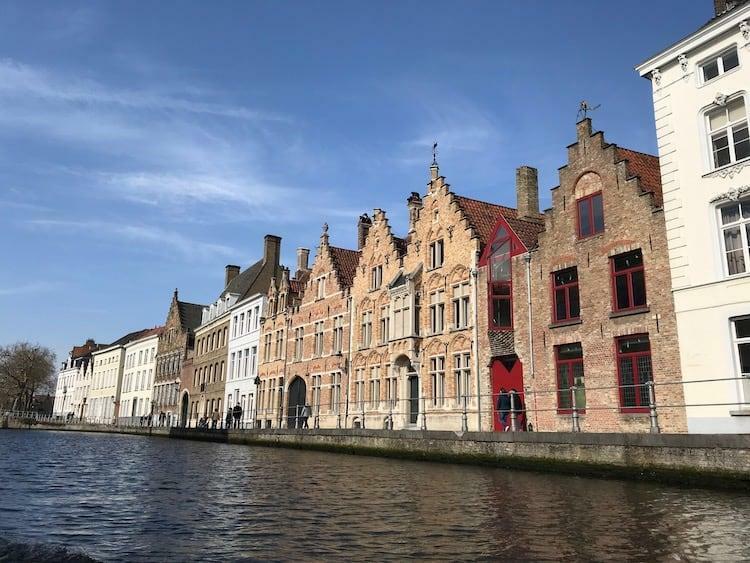 Well not only does it have a wealth of heritage, culture and attractions but – thanks to the Medieval city walls – it is compact enough to fit in the highlights over a long weekend. But if you don’t want to do the planning and research yourself, I have put together a comprehensive 3 day itinerary below. This should allow you to fit in the key sights without feeling too rushed. Aim to arrive for around midday on Friday and leave at mid-afternoon of Sunday and you should have more than enough time to fit in the everything below. To save this map and take it with you, hit the ‘enlarge’ button on the top right and it will open in your ‘Google Maps’ app. If you then go to ‘Your Places’ and choose ‘Maps’ you will find it saved there for future use. 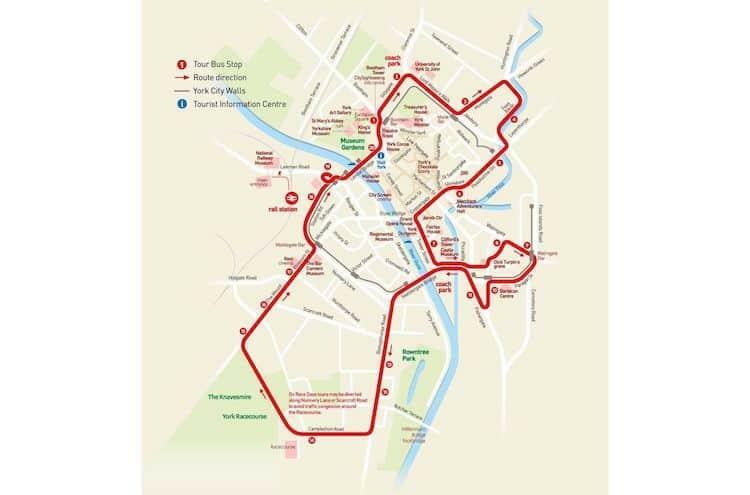 This itinerary works on the assumption you’ll get to York around lunchtime. If you’re a southerner like me, then there’s a 0900 train from Kings Cross that gets into York at 1130, perfect timing for a weekend of adventuring. 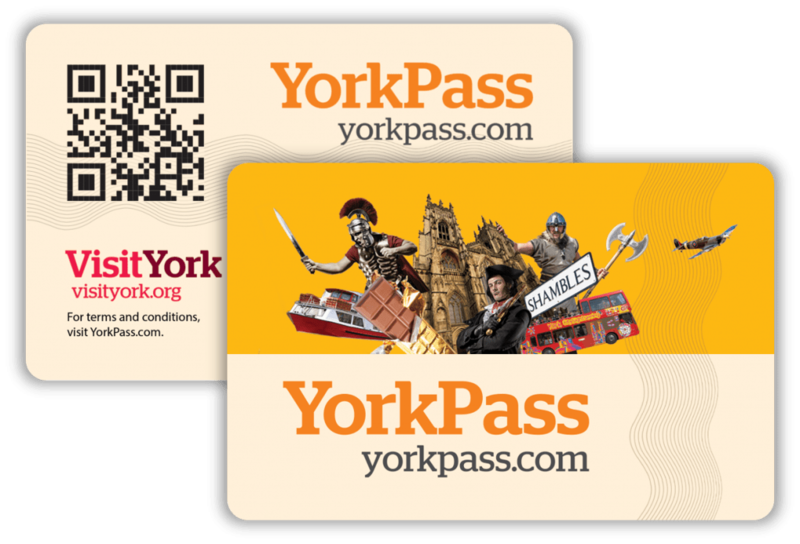 If you are planning to spend your time in York seeing the main attractions then you a York Pass makes sense, as whilst it is an upfront cost, it will save you money in the long run. 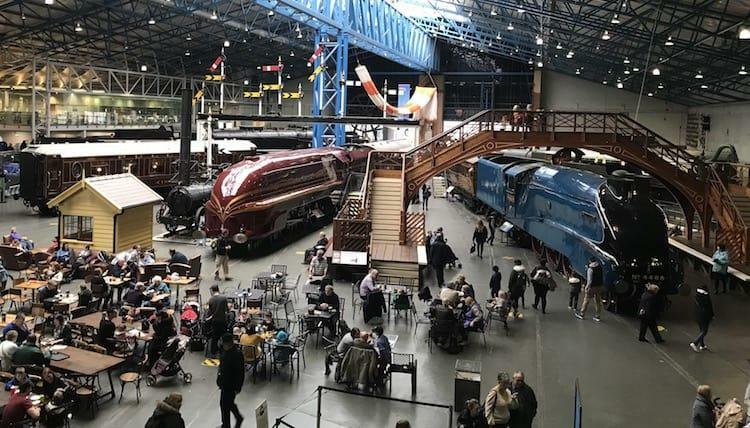 The visitor information centre is really easy to find from the station, just follow the crowds into town towards York Minster and you will see it on your right – on the corner of Museum Street and Davygate. No visit to York would be complete without visiting the imposing and iconic York Minster. Standing at 60 meters (17 stories) tall, it is visible from almost all parts of the city. There has been a church on this site as far back as 627, and it represents England’s oldest type of ecclesiastical centre. 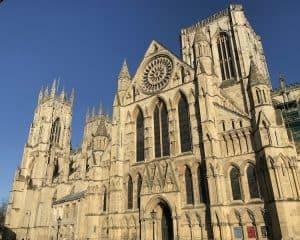 It is technically a cathedral too, and it’s full title is ‘Cathedral and Metropolitical Church of St Peter in York’, but is more popularly known as just ‘York Minster’. Not all cathedrals are minsters, not all minsters are cathedrals, but this is both. 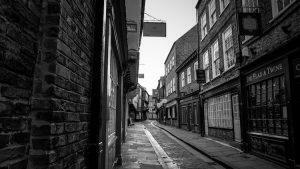 Away from York Minster The Shambles are THE iconic place to see in York. 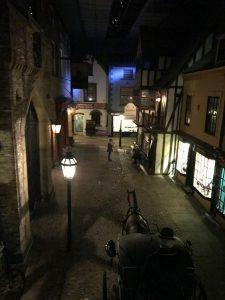 This is arguably the best preserved medieval street in the entire world! Shambles is an old term for open air meat markets, and up until the late 1800s there were as many as 25 butcher shops along this street, with the groove along the middle of the street draining the blood away. These perfectly preserved Elizabethan buildings are also said to be the inspiration for Diagon Alley from the Harry Potter series. 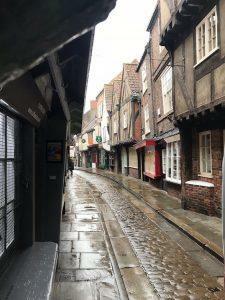 Whilst The Shambles itself is quite a small street, it is right at the heart of York and is a perfect place to start your adventures into the surrounding area. 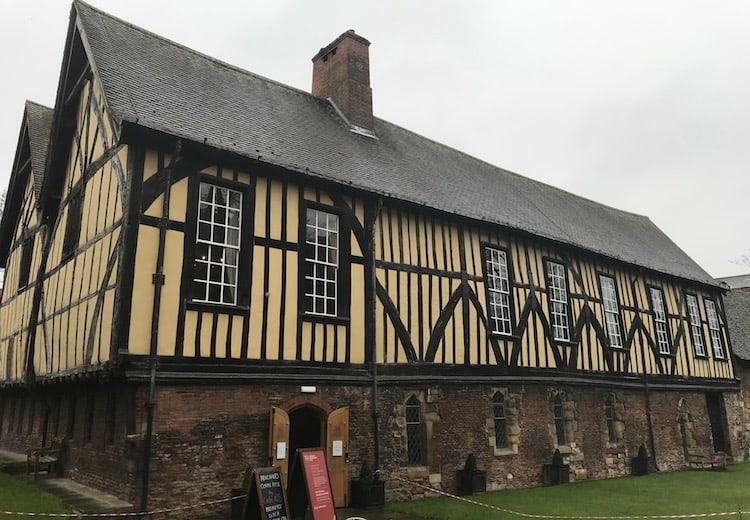 It’s also worth taking the time to visit the Shambles Market in the neighbouring square, which opens daily selling everything from fresh produce to hand-made crafts and second-hand records. There is a long history of chocolate and sweet making in York, with the famous families of Terry’s, Craven’s and Rowntree’s based here. I didn’t really know what to expect from it, but the Chocolate Story turned out to be amazing! 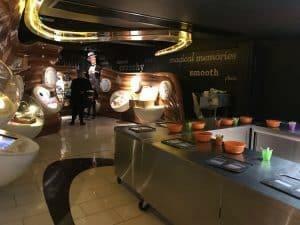 It is a really innovative and informative experience, with everything from an Aztec cinema, interactive talking pictures, hands on displays and our amazing (and very funny!) guide Mark. Oh, and you get to taste a fair bit of chocolate!!! You won’t fail to be impressed by what they’re put together here. It was a great way to spend a couple of hours, with enough to keep both adults and kids interested. Look, I know I’ve already sent you to the Shambles on day 1, but it’s hard to get too much of this amazing street. One of my favourite ways of beating the crowds when travelling is to get up earlier, and if you’re looking for a tourist-free photo of The Shambles this will be your only way. The good news is that York does seem to sleep a little later than cities such as London, so as long as you’re out and about before 0830 you’ll find the streets are fairly clear. So bag yourself the perfect tourist-free Shambles photo, then wander onto the streets next-door to see the early morning sights and smells of the market setting up for the day. I know it’s a bit touristy, but I love open top bus rides! It’s a quick and easy way to see a city, and they are normally really informative. I’d suggest wandering over to Clifford’s Tower and picking up the bus from here, as this will put you in the perfect position for section three of the day. The tour takes about an hour. Keep an eye out for the Terry’s tower – as mentioned in the Chocolate Story yesterday – and York Racecourse, scene where Pope John Paul II famously gave mass to 200,000 people in 1982. These are both places you’d be unlikely to get to without hopping on the bus as they are a bit further out of the centre. York Castle Museum is an interesting, if slightly unexpected way to kill a few hours in York. It’s an eclectic mix of exhibits: from the great wars, the prison, the sixties and even a section dedicated to old children’s games. It is interesting, but certainly not the complete history of York I was expecting! There is one exhibition which makes this museum well worth visiting though…. 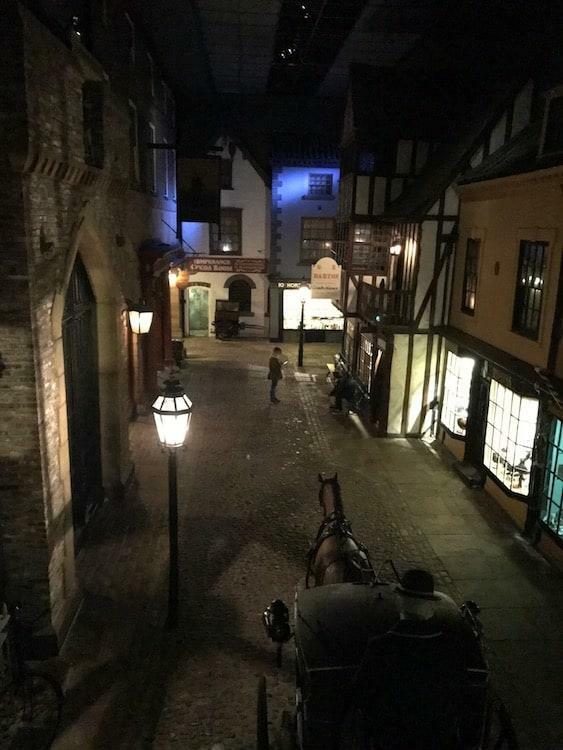 The most famous and spectacular part is Kirkgate, which is an indoor re-creation of a Victorian street. Opened in 1938, it has become the most iconic part of the museum and is worth the price of entry for this alone. Clifford’s Tower is all that remains of York’s royal castle, which is where the power in the north of England was held in the time of William the Conqueror. 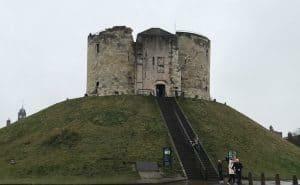 There has been a castle on the site since 1068, but unfortunately it has long since fallen into disrepair and Clifford’s Tower, the castle’s keep, is the only part left standing. It perches atop its hill, looking like it could give way at any minute – large cracks running down the walls and at an angle that suggests an impending surrender to the pressures of gravity. Despite this, it seems to be in good health, with English Heritage controversially planning to renovate the site over coming years. READ NEXT Inthakin Festival, Chiang Mai | Right Place, Right Time! There’s not much to see inside, but the views across the city make it a worthwhile trip. It’s not for the faint of heart though, with slippery, narrow, uneven staircases taking you to the top of the tower. 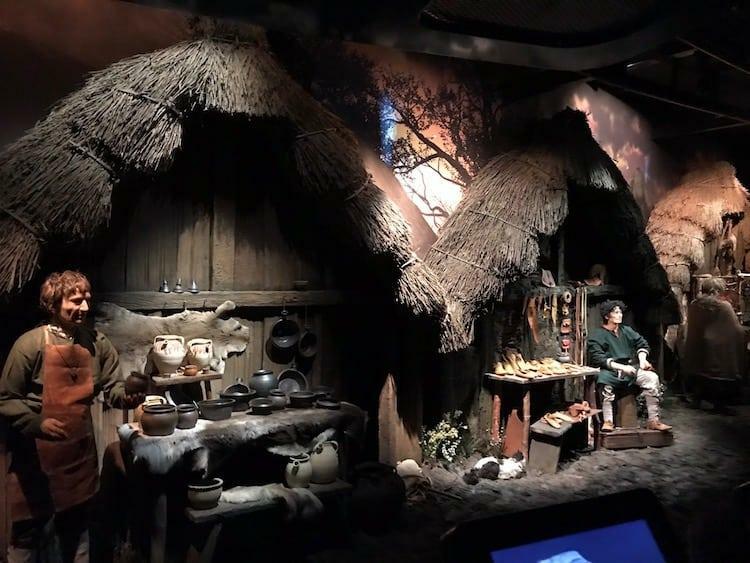 The Jorvik (Viking for ‘York’) Viking Centre tells the story of the Vikings in York. It is more like a theme park than a museum, as the bulk of the experience is on specially commission carts, taking you through Viking village life as it was at 1730, 25th October AD975. It is an immersive experiences, with the sights, sounds and smells of Viking living brought to life in front of you. You can’t help but have admiration for what they’ve done here. It would have been easy to present all the finds from the various digs around York in another stuffy museum (though you can see these after the cart ride). Instead they chose to bring Viking-age Jorvik to life, a captivating experience for all ages. It is thoroughly worth a visit, though expect a wait at peak times, as they can only accept limited numbers due to the capacity of the carts. 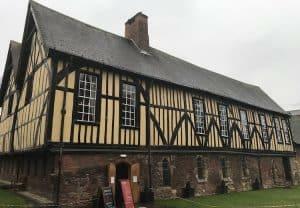 The Merchant Adventurers’ Hall is one of the best preserved medieval guild halls in the world. The oak building is getting on for 700 years old! Stepping inside is like being transported into the CGI of a period movie. It’s easy to imagine this place full of well-dressed people drinking tankards of ale and feasting around a giant table. There is an incredibly informative audio tour that is part of the entry fee, and will teach you everything your need to know about the rich history of the building. And whilst we’re on the subject of rich, there is a fantastic coffee shop downstairs selling delicious homemade cakes! 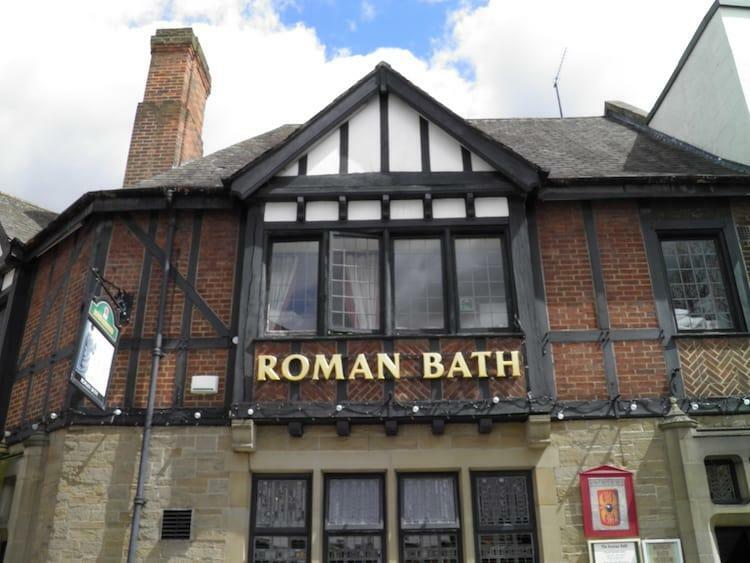 This pub was originally called ‘The Mail Coach Inn’, that was until 1930 when the remains of a Roman Bath were discovered underneath as they tried to extend the beer cellar. It was the Romans who founded York back in AD71, when 5,000 men of the ninth legion set up camp here, and under this pub you can get a glimpse into their world. For a small fee you can view the remains of the bath and cold room, and get a detailed tour of the bathhouse itself and the Roman history in York. And for the childish amongst you, the local reenactment group store their kit here, so you are free check out the fashion trends – Roman style! (Ahem…. check exhibit ‘A’ to your right!). 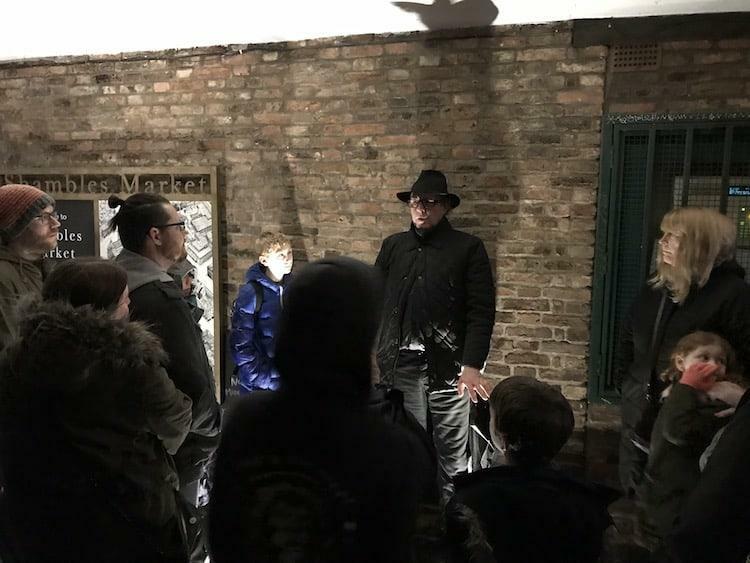 What better way to round off your second day in the city than with an after-dark tour of the most haunted city in Europe. 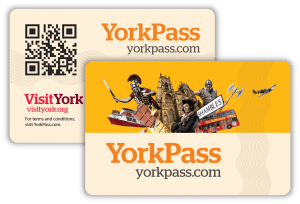 Not only is this a fun way to spend an hour, but it will also get you out into the city after dark and teach you a bit more about York’s long history. Our guide was Greg, a master in the forgotten art of story telling. He took us around the city and told tales gruesome enough to keep the adults interested, but not too scary to frighten off the kids. 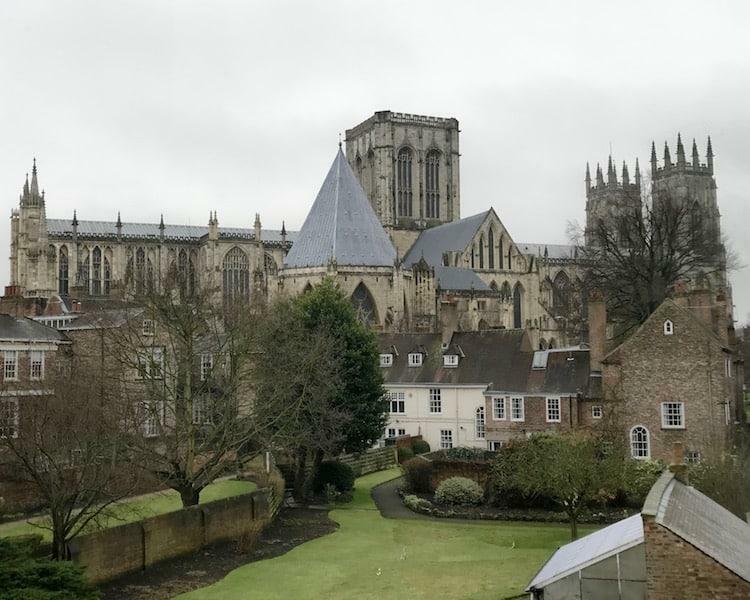 He managed to inter-weave the history of York into his tales, and point out elements of the city that would otherwise go unnoticed, such as the numerous owl statues and black cats dotted along the rooftops. Not a believer? Check out the shadow over Greg’s head in the photo above. It certainly creeped me out when I was looking back through our snaps! The York City Walls are a great way to get a view of the city. They are the longest and best preserved medieval walls in England. Whilst their total length is 3.4km (about a 2 hour walk), you don’t have to do it all at once. The walls are broken up by 5 main bars (gateways), so it’s easy to get on and off the walls at various points across the city. They open from about 0800 most morning (weather dependant), so are a great way to start your last day in York. My favourite part is the northwest corner between Bootham Bar and Monks Bar. It is a fairly short walk (about 20 minutes), but gives incredible views across the back of Treasurer’s House, and is one of the few places in the city you can take a full width photograph of York Minster (my photo above was taken on this walk). If you want more information about this walk, then visit the amazing Friends Of York Walls website, which will give you a full guide to this walking trail and many others! The Yorkshire Museum gives a comprehensive history of Medieval York, and holds some fantastic treasures found buried nearby. Included here are some of the finest Medieval items ever unearthed including the Middleham Jewel, worth over £2.5 million and discovered in 1985 by antiques dealer Ted Seaton, who was out with his metal detector. You will also find the mysterious sapphire centre Escrick Ring, and a Richard III supporter’s Boar Badge, which helped historians pinpoint the Battle of Bosworth. In the grounds of the museum you can also find the remains of St Mary’s Abbey. 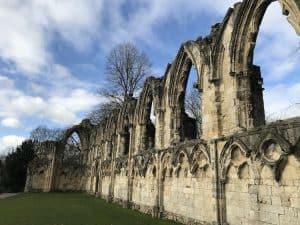 For 450 years it was the most powerful abbey in the north, but was destroyed in the mid 1500s under Henry VIII’s drive to disolve the monasteries. 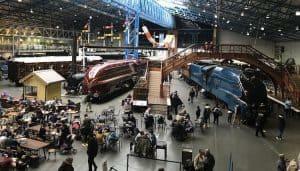 If you are in any way interested in the engineering or history of the railways, then York’s National Railway Museum – the largest of its kind in the country – is well worth a visit. Amazingly it is free, meaning you can take in as much or as little of it as you like without feeling too much pressure. 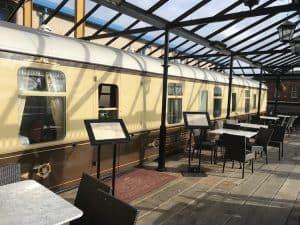 The Countess of York is a beautifully restored 1956 railway carriage, that has been converted into an Edwardian style dining car. What better way to finish your long weekend in York than with a luxurious lunch. Being close to the train station makes it easier to access for your trip back home. And with an 86% 5 star rating on Tripadvisor at the time of writing, it is an experience that is not going to disappoint! Book in advance to make you sure you get a table, as they seemed really busy when we were there. Try and give yourself 1 1/2 hours before your train leaves so you don’t feel in a hurry.